Elinor Ostrom's Nobel Prize-winning work on common pool property rights has implications for some of the most pressing sustainability issues of the twenty-first century - from tackling climate change to maintaining cyberspace. 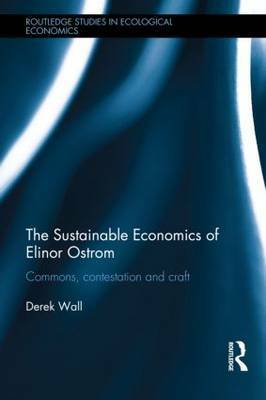 In this book, Derek Wall critically examines Ostrom's work, while also exploring the following questions: is it possible to combine insights rooted in methodological individualism with a theory that stresses collectivist solutions? Is Ostrom's emphasis on largely local solutions to climate change relevant to a crisis propelled by global factors? This volume situates her ideas in terms of the constitutional analysis of her partner Vincent Ostrom and wider institutional economics. It outlines her key concerns, including a radical research methodology, commitment to indigenous people and the concept of social-ecological systems. Ostrom is recognised for producing a body of work which demonstrates how people can construct rules that allow them to exploit the environment in an ecologically sustainable way, without the need for governmental regulation, and this book argues that in a world where ecological realities increasingly threaten material prosperity, such scholarship provides a way of thinking about how humanity can create truly sustainable development. Given the inter-disciplinary nature of Ostrom's work, this book will be relevant to those working in the areas of environmental economics, political economy, political science and ecology. 'One of our age's most elusive yet most necessary aspirations is an ecologically sustainable self-governing society. So how is it that so many of us managed to miss Elinor Ostrom for so long? She spent a lifetime exploring this aspiration, and drew on an extraordinary range of sources to do so. Derek Wall has written an inspirational book about this key figure of our times. We have much to learn from her - and from him.' - Andrew Dobson, Professor of Politics, Keele University, and author of Green Political Thought.